THANKS FOR LOOKING AT OUR LISTING! WE HAVE TWO ONE BEDROOM PROPERTIES IN THE ONE COMPLEX. THIS LISTING IS FOR THE PARIS STYLE APARTMENT. THE CARLTON COURTYARD IS ALSO OUR LISTING IN THE SAME COMPLEX. Carlton is a buzzing area, full of culture, cuisine and class. Step around the corner of the apartment and be dazzled by the array of fine eateries, cafes, delicious pastries and gorgeous boutiques. Take a walk along the Lygon street strip into the beautiful gardens or laze about in the Piazza. Carlton is close to the CBD, Royal Melbourne Hospital, Royal Dental Hospital, Universities and some of Melbourne's most famous attractions. From the apartments you can catch the tram into the CBD or even into Melbourne’s northern suburbs. In this complex we have two, one bedroom apartments available; THE PARIS STYLE apartment and THE CARLTON COURTYARD apartment. 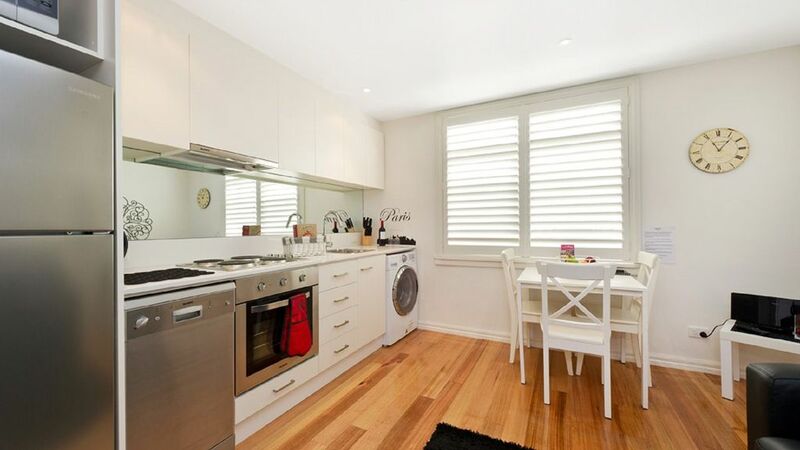 Position Perfect Carlton- Paris Style apartment is a one bedroom apartment conveniently located just off beautiful Lygon Street, or ‘Little Italy’. This apartment is on the second floor with stairs leading up to the apartment. There is no wheel chair access. The apartment has a queen bed in the bedroom and a double fold out sofa bed in the living area. Up to three adults can be accommodated, or two adults and two children. The price for 2 guests is for Queen bed only. Sofa bed is $15 per night. The apartment is equipped with a brand new kitchen, including oven, microwave, dishwasher and full sized fridge. It has a fully renovated bathroom with shower, off the bedroom. Crisp, fresh, quality linen and towels are supplied for your use at no extra cost. We offer our guests a parking permit to use during your stay. This allows you to park unrestricted in the permit zone 4C spaces. There are several permit parking spaces directly outside the apartment block. The apartment has a queen bed in the bedroom and a double fold out sofa bed in the living area. Up to three adults can be accommodated, or two adults and two children. This fully furnished apartment offers clean, comfortable and affordable accommodation with all the extras for you to enjoy your stay in Melbourne. Check out our great reviews from wonderful guests such Heather who said “As the name suggests...Perfect! Would highly recommend this accommodation to anyone coming to Melbourne and will certainly stay here again. On arrival the apartment was absolutely spotless. The apartment more than met my expectations. It was extremely well appointed with absolutely everything we could possibly need. It was nice being somewhere so comfortable and convenient. Thank you for such a wonderful place to stay! Included in the price for our apartments is fresh, clean, quality linen and towels. Our Carlton Paris style apartment has a parking permit for you to park in residential zones. At Position Perfect, we are a family owned business dedicated to providing guests with comfortable, and clean accommodation in prime Melbourne locations. Whether it is for a relaxing holiday or a family visit, our apartments in Melbourne are the perfect self-catering properties with a homely, personal touch. With lovely properties in charming locations, our apartments are the perfect short-term accommodation choice. As a family owned business, our own travelling and holiday renting experiences of 15 years have greatly influenced us. We know first hand what makes the perfect stay and what has the potential to ruin it. With these experiences on board, we have committed ourselves to providing our guests with apartments that are comfortable enough to feel like their second home. Whether this is through full kitchen and laundry facilities, or our own friendly customer service, our attention to detail is unmatched. Does the apartment have parking? In our Paris Style apartment we offer our guests a parking permit to use during your stay. This allows you to park unrestricted in the area. There are several permit parking spaces directly outside the apartment block. Is there a charge for the parking? No, the parking is free. Is the apartment close to public transport? Yes! You can catch a tram to the CBD and Melbourne’s north. The tram stop is 100 meters from the apartment. The price you are quoted is inclusive of taxes, cleaning, linen, towels etc. no extra charges apply. Do you require a cash bond? We do not ask for a cash bond; however a credit authorisation is requested at time of booking for security purposes. If you are booking through Stayz/HomeAway we will contact you for your card details prior to check in for security. Please refer to our terms and conditions for more details. The apartment was perfect for mum and dad and a 6 year old to enjoy a few days in Melbourne. Great location near Lygon Street and the huge choice of excellent restaurants (especially Italian) and an easy walk into the downtown area. Danielle and Ruth were able to offer us a later check out which was certainly appreciated. Hope we can again enjoy the apartment on a future trip to Melbourne. Perfect as the name says. I really enjoyed every moment of my time at this property. It is in a fantastic location, the apartment was beautiful and clean. Everything that is great about Melbourne is basically within walking distance. I will definitely be looking to rebook this property, next time I am in Melbourne. My wife and I booked a trip to Melbourne to come and see the comedy festival which by the way was brilliant. Carlton Paris Apartment was ideal for our short stay. Great communication from owners Ruth and Daniel throughout stay. The one bedroom unit is located up on the top level of a small apartment block close to Melbourne Uni and Lygon St. Probably the most private unit in the block. First impressions was that it was clean, neat and tidy and looked like it had just been newly renovated. All facilities you need for your stay were in the apartment. On arrival we had a nice bottle of wine awaiting us along with a spare set of keys, parking permit if required and clean towels etc. The owners gave us complimentary access to their wifi which was generous. Highly recommended! Thank you very much for your lovely review. We are so pleased you enjoyed the apartment and made the most of the location. We look forward to welcoming you again. We found the position of the apartment fantastic with easy access to the city, hospital, airport & lygon street. Also surprised by the quiet street so close to lygon street. Great to find wine & large container of milk in fridge. We also found the price reasonable & would definitely stay there again & recommend it to others! Thank you so much Debbie. Such lovely feedback. We welcome you back anytime! My new Amercan wife, 18yr old stepdaughter and I stayed here for 8 days in November, we found it clean, comfortable and perfectly located to explore Lygon Street and surrounds as well as close proximity to the CBD. I would recommend this apartment highly. Ruth and Danielle were very helpful and easy to deal with. 5 stars! Wow thank you so much. We look forward to having you stay again soon.